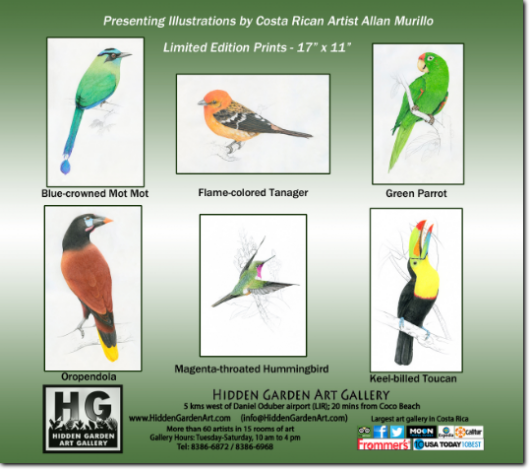 Allan Murillo hails from a picturesque Costa Rican town called Pital de San Carlos. The area is prized for its serene, all-encompassing commune with nature. At age 16, Alan’s family moved to San Jose where he soon began his studies as a graphic designer in fine arts at the University of Costa Rica. From childhood Allan displayed a special talent for drawing, taking his keen love of his natural surroundings and meticulously rendering them on paper. Birds and animals: all transposed in infinite detail to his work. Whether manual or digital Allan unites these diverse forms to truly express his love of the art form.